Ultra Music Festival Miami recently released info on its Phase Two line-up, and added to the Phase One headliners are Crystal Castles, Dash Berlin, Deadmau5, Richie Hawtin and Steve Angello. In a huge move from event organisers, and for the first time in the festival’s history (and ASOT’s history for that matter), both Deadmau5 and Eric Prydz will headline the ASOT Stage before Armin van Buuren closes the Megastructure on Sunday night. Richie Hawtin will be joining Carl Cox & Friends in The Megastructure on Saturday, while Dash Berlin and Steve Angello will be throwing it down on the Main Stage. Last up from the Phase Two headliners, Crystal Castles will be returning to Ultra’s Live Stage armed with a load of brand new material, for what may be one of the highlights of the weekend. In another Ultra first, Tiësto will play a one-off Sunset Slot at the Main Stage on Saturday. Two labels will be taking over the UMF Radio stage across the weekend, with Hardwell’s Revealed Recordings hosting Friday for the very first time, before Skrillex’s OWSLA imprint returns on Saturday to provide the bass. To complete the Resistance stage, Space Ibiza returns on Saturday to host possibly some of the finest names on the house and techno circuit. 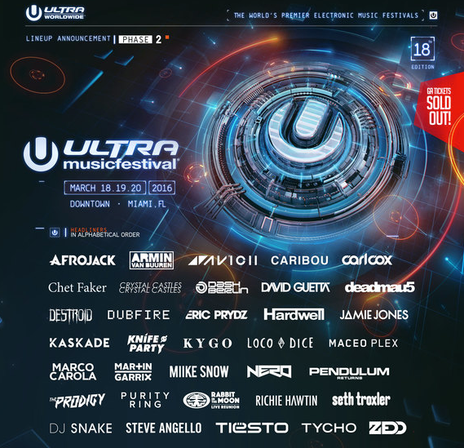 Ultra Music Festival takes place on 18, 19, and 20 March 2016, during Miami Music Week and is an 18+ event.